Androids in space are standard sci-fi fare, but a British research firm plans to actually power a satellite with one–it’s using a Google Android phone as the spacecraft’s brains. The experiment is being carried out by Surrey Satellite Technology Limited in Guildford, U.K., as part of an initiative to try to use common all-garden technology in space vehicles so that costs may be dramatically reduced. The idea is that, as SSTL’s project manager Shaun Kenyon noted, “modern smartphones are pretty amazing” and they have powerful, power-sipping processors that run over 1 GHz in clock speed and can have copious memory storage–particularly in the case of an Android phone with SD card expansion. A smartphone is effectively a mini computer, with its own power supply, input-output interface, and radio communications, which means it’s very similar to the core components of most satellites. The difference is that satellites typically require custom hardware, right down to CPU level, space-hardened electronics and other expensive hand-built devices and systems–all of which bump up the price of designing and building a satellite. Nanosatellites are one way to reduce this cost, cramming all the necessary technology for a “quick and dirty” space mission into something that’s typically shoebox-size, which lowers the price for firing it into space. But SSTL’s idea is to go one stage further and combine a nanosat with the phone. They’re not adjusting the $450 Android phone at all, not stripping it down and integrating its tech into their circuitry. Instead it’ll be hooked up using a standard connector, and there’ll even be a camera aboard the satellite in question (STRaND 1) that looks at the phone’s screen to make sure it’s working, and to help control it from the ground HQ. At first STRaND will run on its own electronics and control hardware, and will carry out its clutch of experiments, which include imaging Earth with an on-board camera. Then it’ll check the phone is working and hand over control to Android (well, a dedicated App they’re writing for it anyway) which will try and manage the location of the satellite using GPS and then control it with reaction gyros and tiny pulse plasma jets. 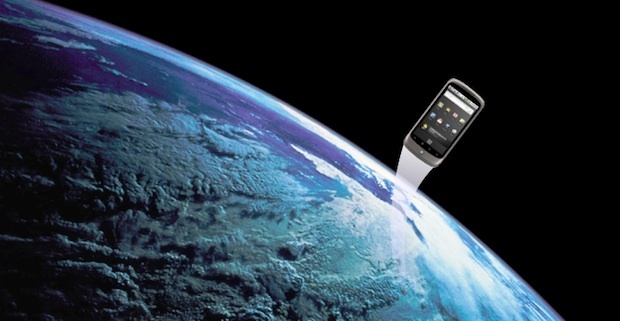 The phone will even be commanded to snap pictures of its own from orbit. And as the commercial space biz begins to kick off seriously this year, there could be all sorts of side effects like interesting science, technology, and medical benefits that may influence your life.